How cute is this? Plus… it is so easy to make!! You do not have to be creative for this one! 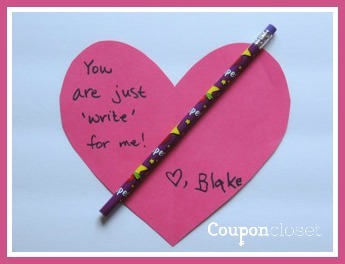 Now, if you don’t want to cut and write on your own, then I created a FREE Valentines Heart printable for you. 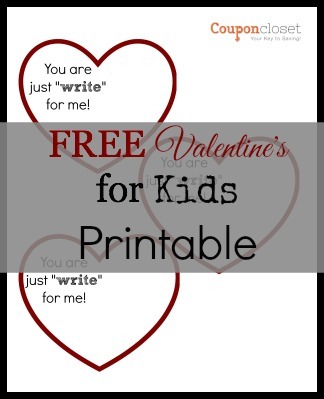 Download your free “Just Write for me” Valentine here. Cut out the Construction paper into hearts – Or download printable here. Write the Words” You are just write for me” on each one. Attach a pencil with a piece of tape, or cut slits into the heart like we did in the butterfly valentine. That is it!! I told you – this is a very easy and very cute valentine – perfect for your kids classroom this year. 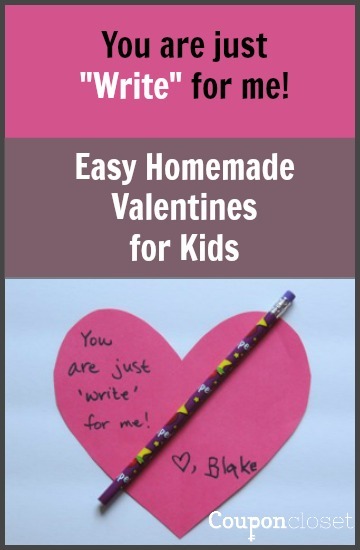 Find more Easy Homemade Valentines for kids here. Hi! This is Jessica stopping by from Krazy Life Of Coupon’s. Thank’s for this idea. This is to cute. I can’t wait to try this with my kiddo’s. My kids love this idea!